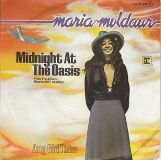 I recently saw a jazz compilation CD in a London shop and noticed it included Midnight at the Oasis by Maria Muldaur who is generally classed as a folk or blues singer. If you know the song, you can understand why it was included, but what genre exactly does Maria fit into? The answer is, all of the above. I guess it’s similar to the question; is Jerry Lee Lewis and rock ‘N’ roll singer or a country singer and again the answer is both. Maria was born Maria Grazia Rosa Domenica D’Amato in the Greenwich Village area of downtown Manhattan, New York. Unlike the rest of Manhattan, the area is made up of street names rather than numbers and is the home of New York University. In the sixties it was home to the folk and blues music scene as well as a stack of quality record shops. She shortened her name to Maria D’Amato and began working with future Lovin’ Spoonful frontman John Sebastian and then teamed up with David Grisman and Stefan Grossman to become the Even Dozen Jug Band. They recorded just one self-titled album before splitting up. The following year she was invited to join Jim Kweskin & His Jug Band as a featured vocalist. The band comprised Fritz Richmond, Geoff Muldaur, Bob Siggins and Bruno Wolfe. Geoff Muldaur was the guitarist whom Maria later married and took his surname for her professional name. The album was recorded in California but initially sparked little interest. Later the same year she met a songwriter called David Nichtern, who later became a teacher of Shambhala Buddhism, and he contributed a handful of songs to her eponymous second album. “I actually produced the demo (in Woodstock) that got Maria her Warner Bros individual artist deal,” recalled Nichtern, “so I was on the map already with them to that extent. On that demo was a song I wrote called I Never Did Sing You a Lovesong which made it onto the album but was re-recorded.” He also contributed Midnight at the Oasis and Three Dollar Bill, the latter of which was co-written with Dr John. Nichtern explained, “I wrote the song before I started working with Maria, the details are a little bit intimate, but let’s just say there was a girl, a waterbed, feta cheese and grape leaves. I played Midnight at the Oasis for (president of Warner Brothers) Lenny Waronker and he liked it and wanted to include it on the record. The song reached number 21 in the UK but number six in America. Her follow-up single, a remake of I Am woman failed to chart in the UK thus consigning Maria into the one-hit-wonder category. In the States, that follow-up made number 12 but no further chart success over there puts her in the two-hit wonder category. The song had a second chance when it was covered in 1994 by the Brand New Heavies and reached number 13 in the UK. Maria has since released over 30 albums and her 2005 album, Sweet Lovin’ Ol’ Soul, was nominated for both a Blues Music Award and a Grammy in the Traditional Blues Category.